The history of the Cobra helicopter is a long and varied one, characterised by extensive deployment in some of the most dynamic theatres of war. 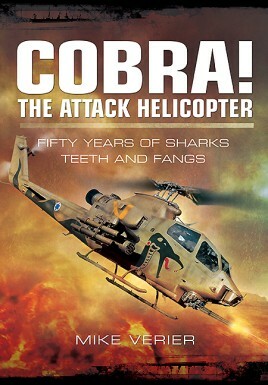 Designed in 1965, we are fast approaching the 50th Anniversary of the craft's inception into the world of combat flight, so it seems timely that we should be presented with this, a comprehensive historical account of the various landmarks of the Cobra's service history. This heavily illustrated volume relays the story of the Cobra from the days of early development and concept dissection right through to modern day uses, in both combat and civil contexts. Details of the early trials at Rucker are detailed, as is the birth of air mobile deployment, offering an illuminating insight into a most eventful period of developmental expansion. A full account of the Cobra's service history during the Vietnam campaign is also on display, describing the various tactics and weapons employed. The development of iconic variants such as the King Cobra and Supercobra is outlined, their individual histories set alongside those of lesser known and under-sung types, one off designs and oddities that add yet more colour to this fascinating history. Included alongside the authors text are first hand accounts that supplement the history, enlivening the facts with accounts of authentic pilot experience, the handling and flying characteristics that can perhaps only truly be described by those in command of such machinery. The work is brought thoroughly up to date with details of current deployment and uses in both combat and civil capacities. The employment of the Cobra by NASA and USCS illustrates its usefulness in a variety of fields, proving that the craft is so much more than a mere component part of the machinery of war. This book is sure to appeal to helicopter and aviation enthusiasts keen to enhance their understanding of this iconic type. It has been long defined, and with good reason, as 'the Spitfire of the helicopter world' – here it is granted the platform it deserves in order to be appreciated by a wider audience.